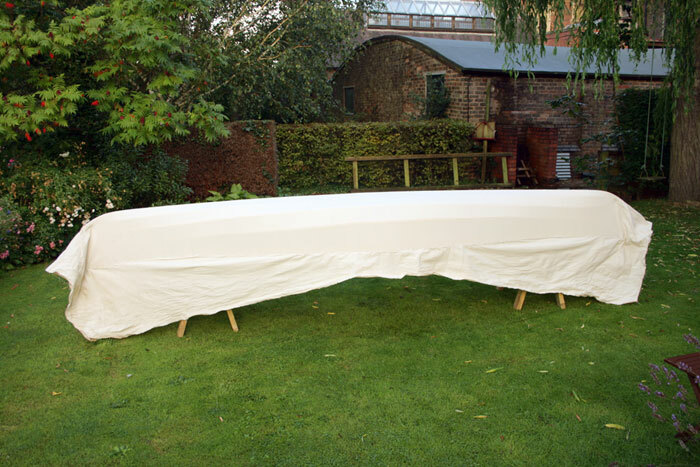 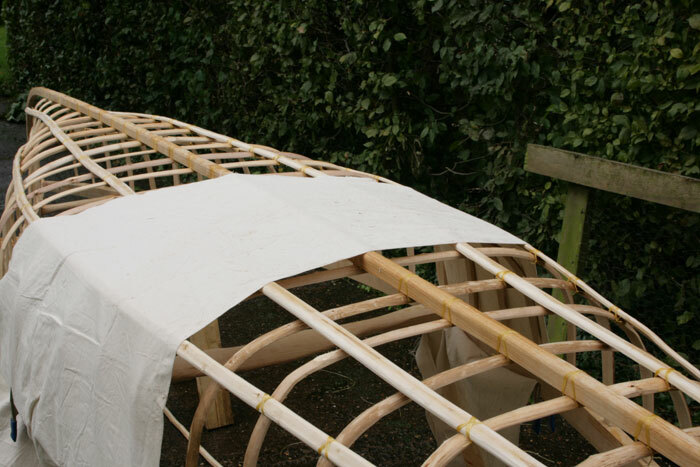 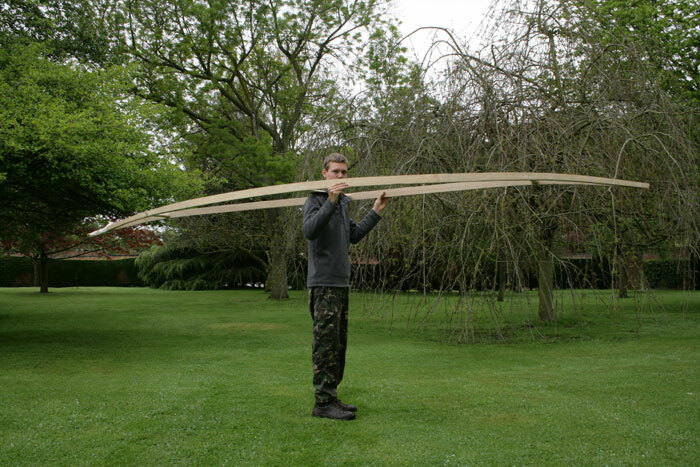 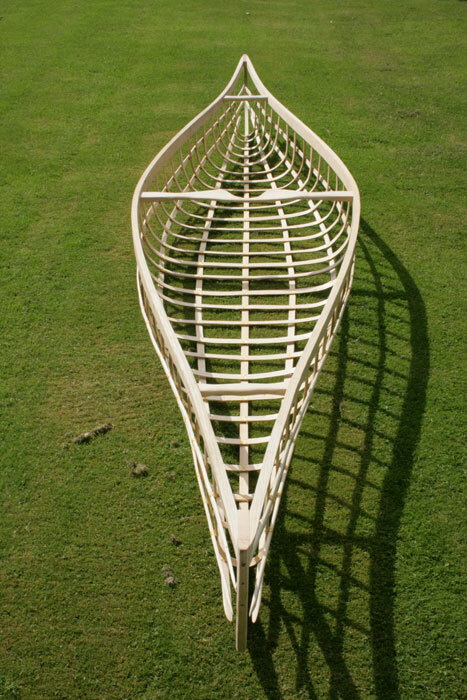 There are no plans for this canoe, all I knew is that I wanted it to be around 4.5 meters long (big enough for 2 people) and about 90cm wide at the centre. Most of the build decisions are made by eye. 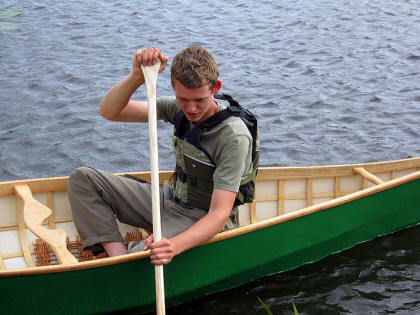 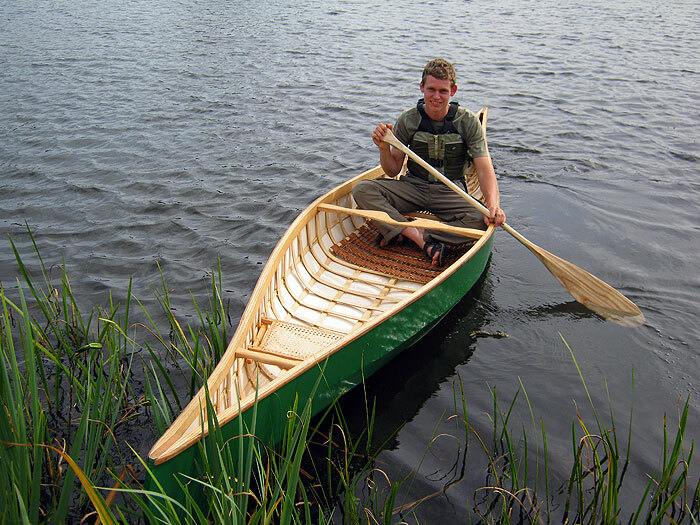 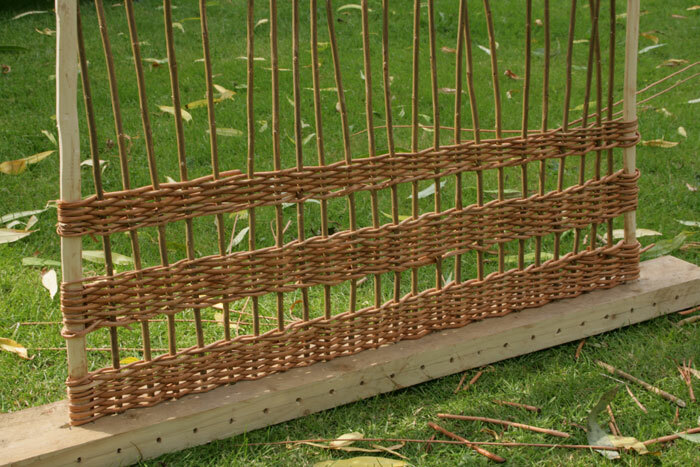 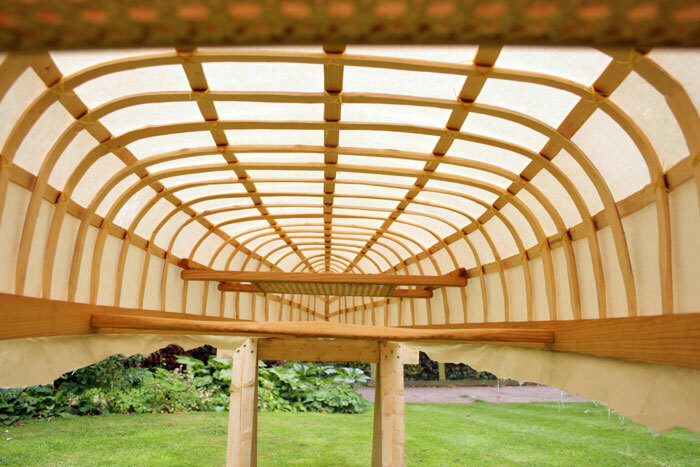 This is not a canoe made from 100% wild materials like a birch bark canoe, but a mix of traditional wood working skills, some coppiced Hazel, some cotton canvas and even a few wood screws. The emphasis for me is always on doing a proper job; speed is not the essence. 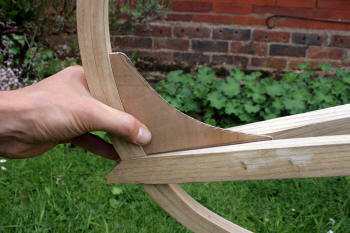 I am always reluctant to use power tools as I feel mistakes can be made quickly with such hasty devices. Also the end product just feels special in some way that i can't describe if everything is done by hand. Hand tools are more sympathetic to this kind of project. 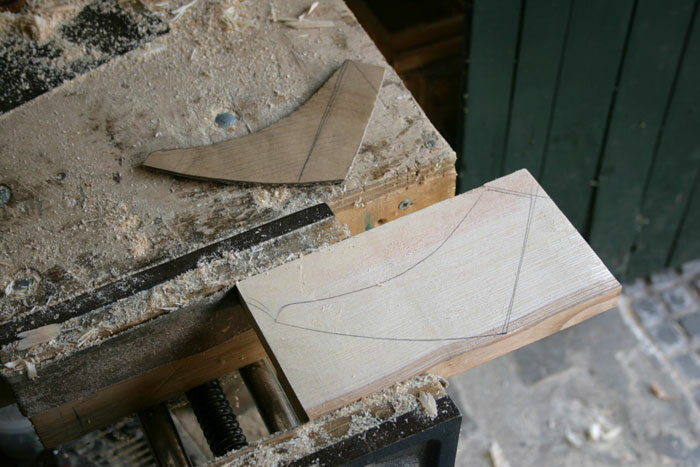 Shaving down to final dimensions using draw knife and shave horse (20mm x 55mm with gradual taper towards ends - down to 3cm high with no change to width. Steam bending Indian ends on gunnels. 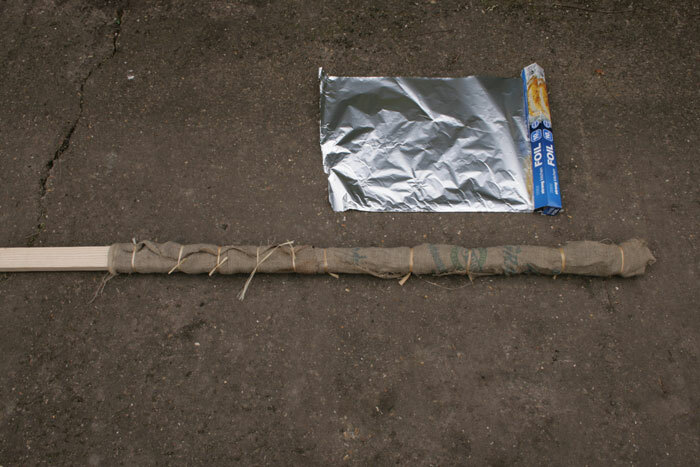 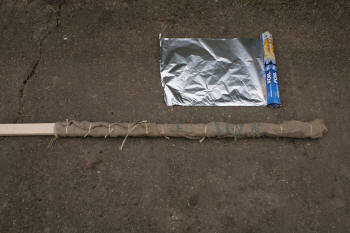 Simply wrapped wood in wet hessian sacking and aluminium foil then propped over fire. 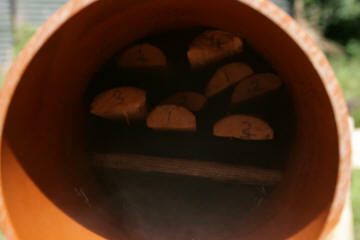 Steamed for 1.5 hours. 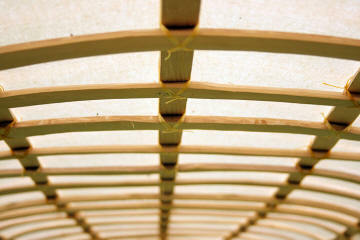 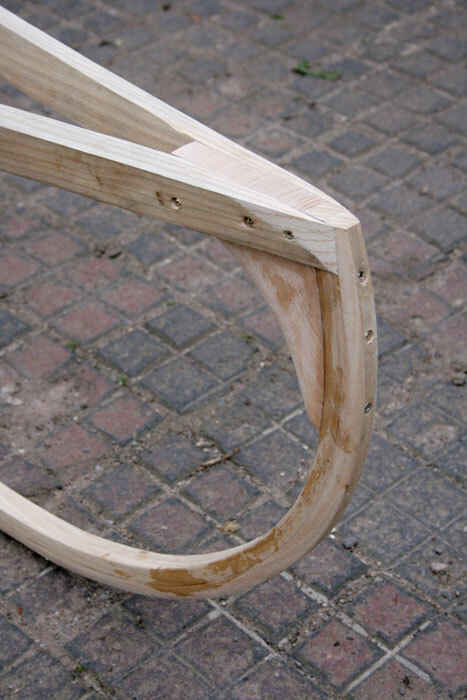 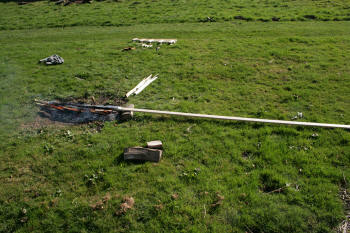 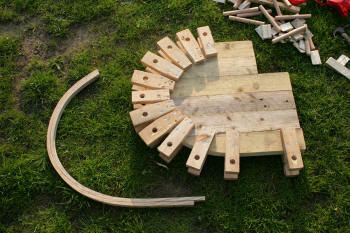 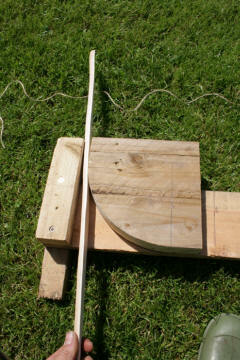 Form made from scrap wood - dowel and wedge system. Form needs to be more extreme in shape as wood will relax a little. 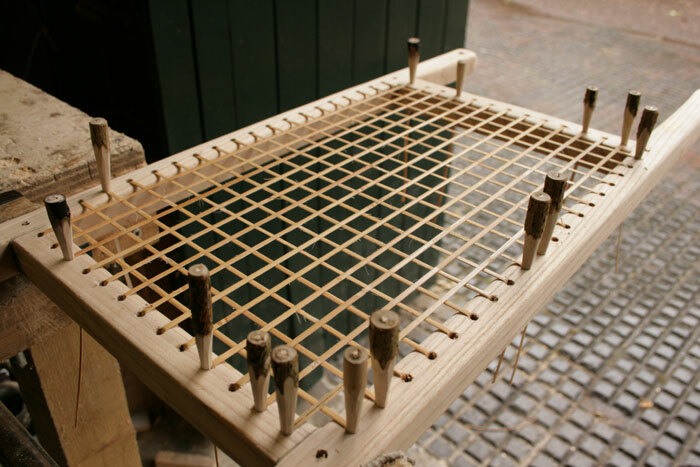 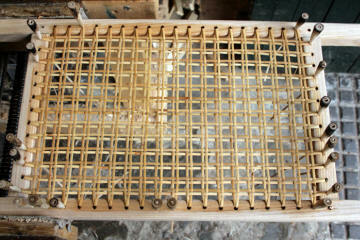 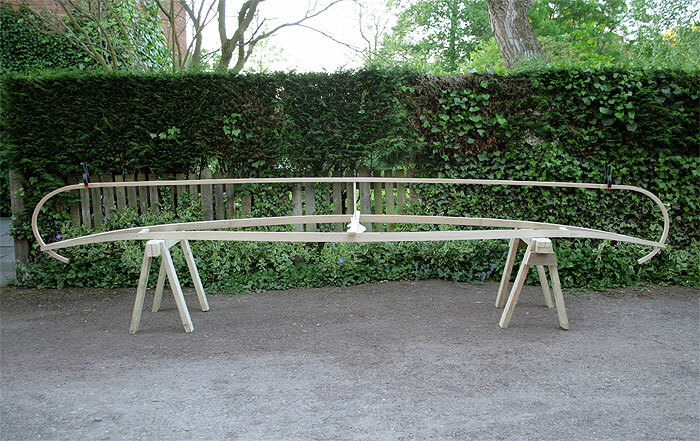 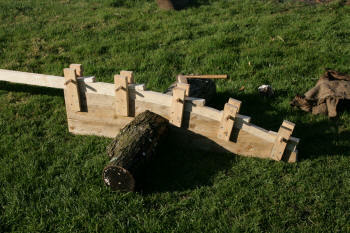 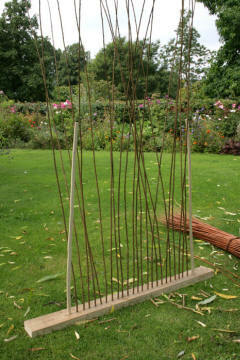 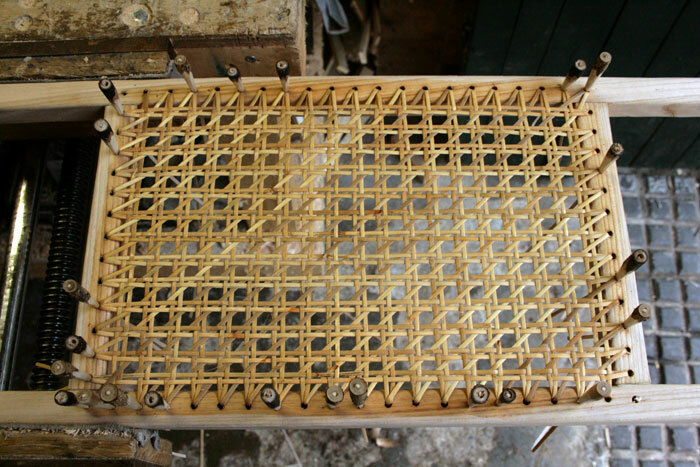 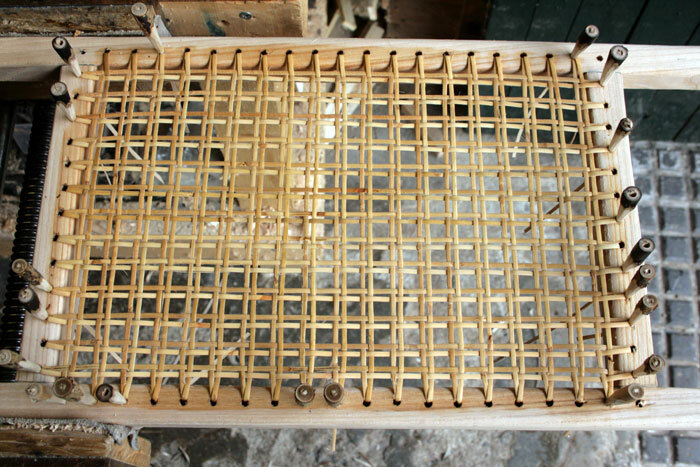 Leave wood in form for several days for wood to dry and take new shape. 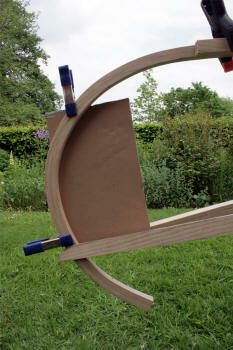 Temporarily checking shape with straps and scrap wood. 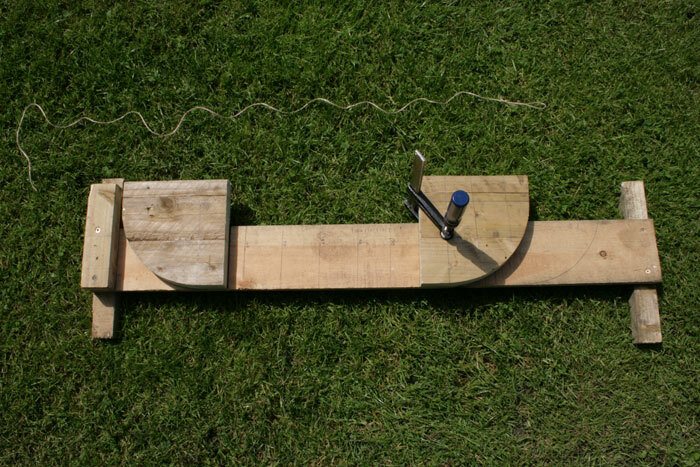 Envisaging stem shape with cable on cardboard - Marked around cable with marker pen and used as template for making steam bending jig later. 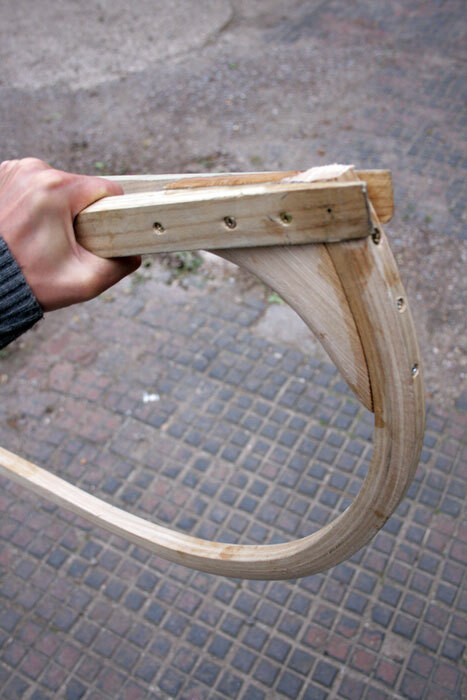 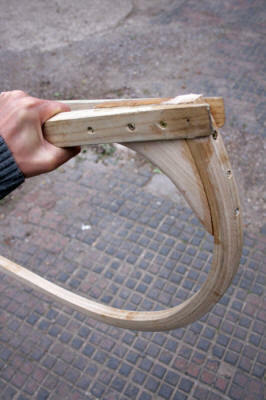 Carving Yoke from Ash wood - The yoke is a piece of wood shaped for carrying the canoe on the shoulders (like a water carrying yoke) - To be fitted at at centre of canoe as the main Thwart. 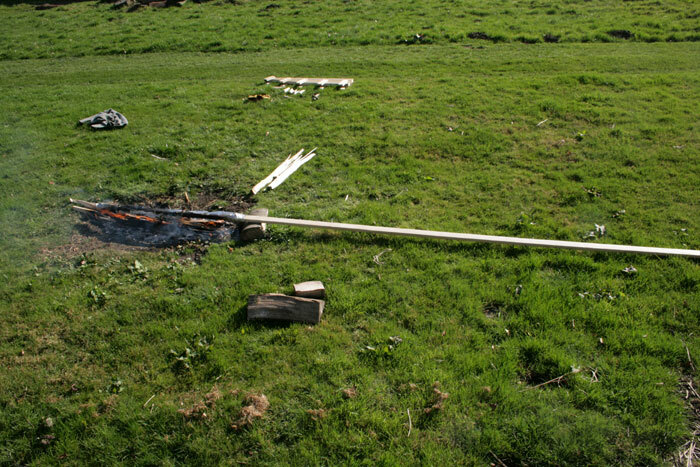 Stem pieces bent in the same way as gunnels over fire with tin foil method. 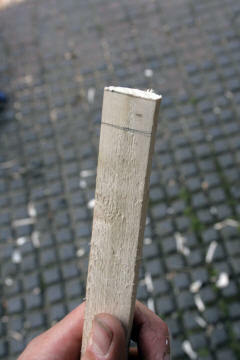 Stems made from lamination of two pieces - one thick piece would be liable to breakage when bending. 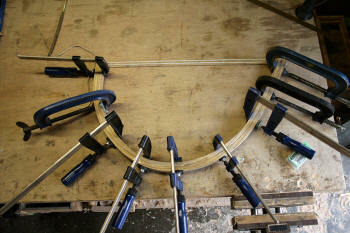 Gluing two laminations of wood together for each stem piece with epoxy. Clamp to ensure good bond. 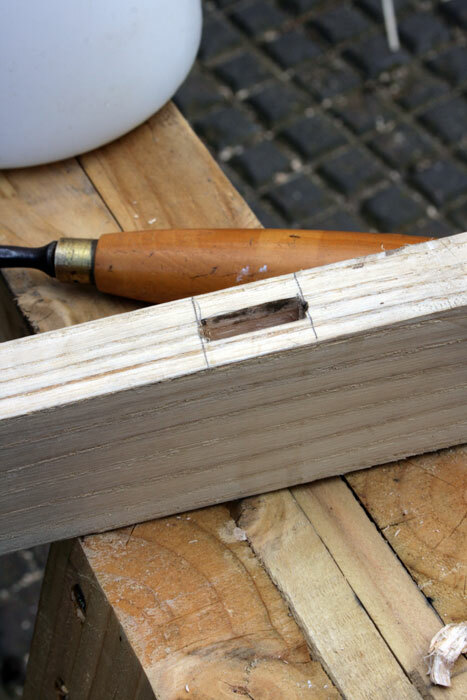 Keel baton cut from Ash plank (20mm x 25mm thick) and clamped temporarily along with Stem pieces to the Gunnels to judge next stage. 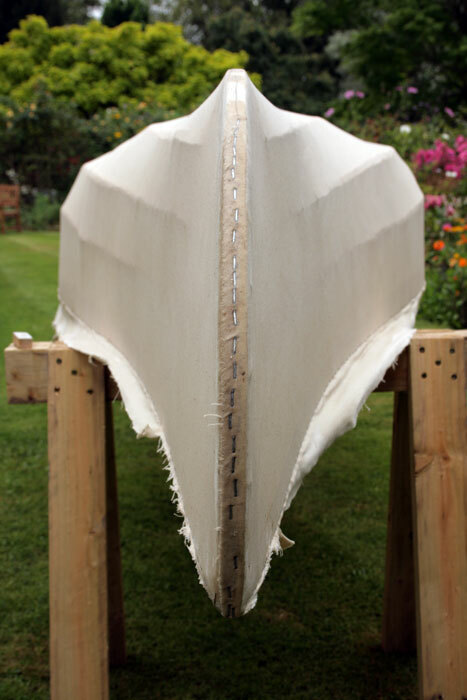 'T' shaped spacer at centre used for temporarily holding keel baton at desired depth. Making a cardboard template for a bracket which will connect Stem pieces and gunnels together. Stem and keel baton spliced together - glued and screwed. Bracket shaped and smoothed, then pieces permanently glued and screwed together. 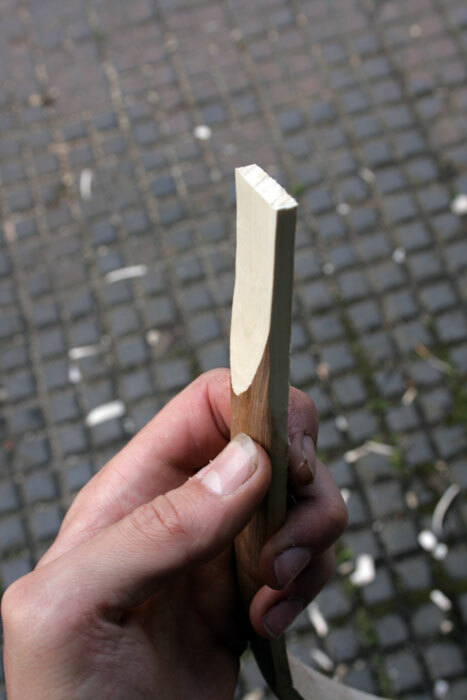 Rasping wood joints flush, further smoothing with cabinet scraper and sand paper. 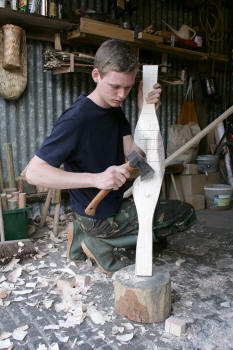 Carving flat ribs from straight shoots of Hazel wood. 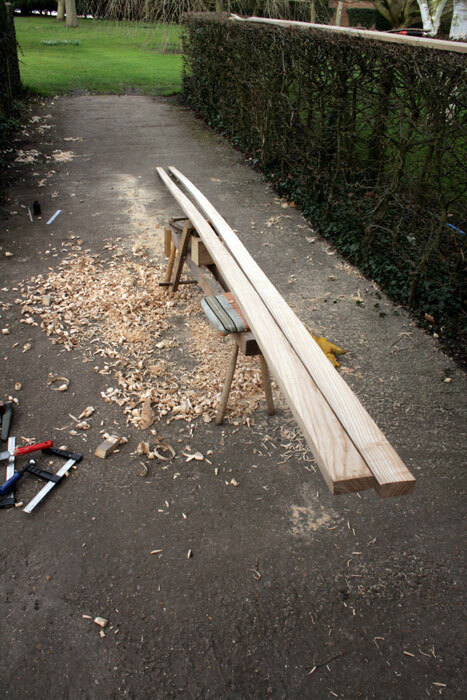 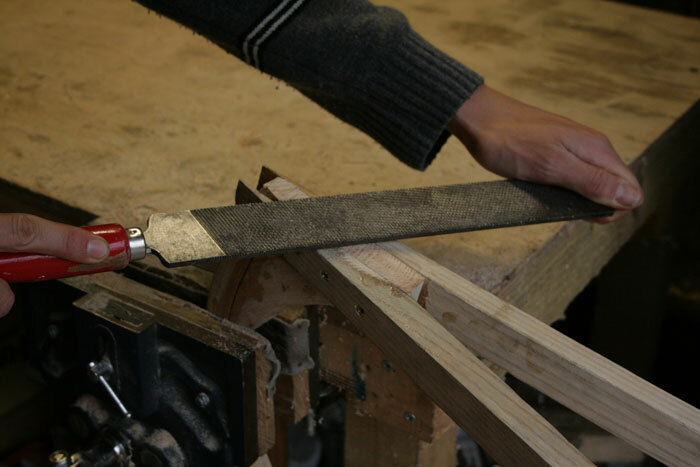 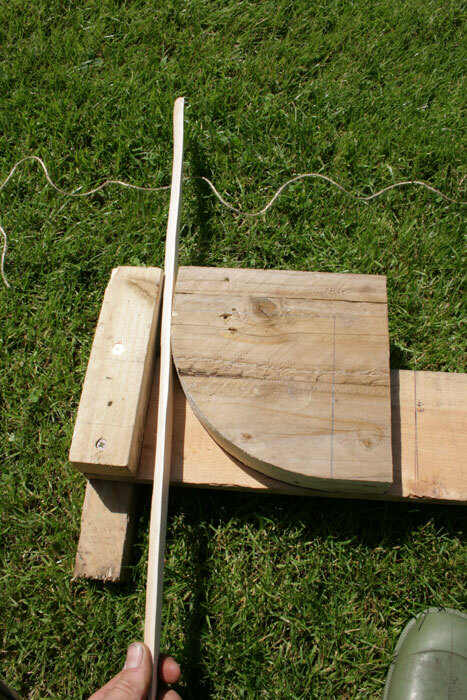 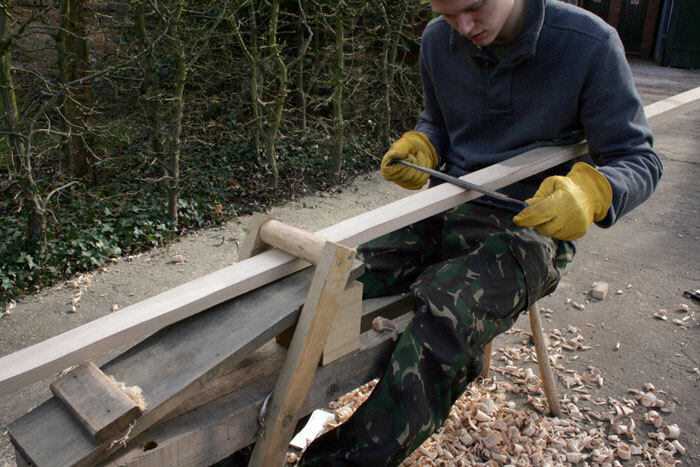 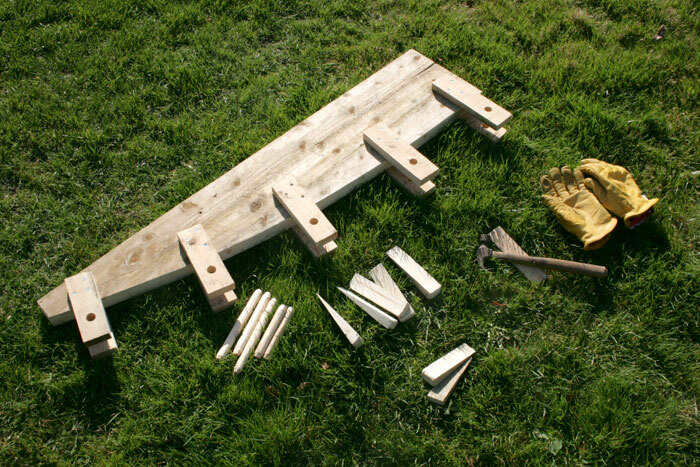 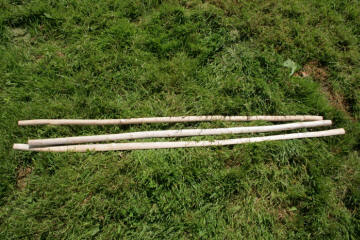 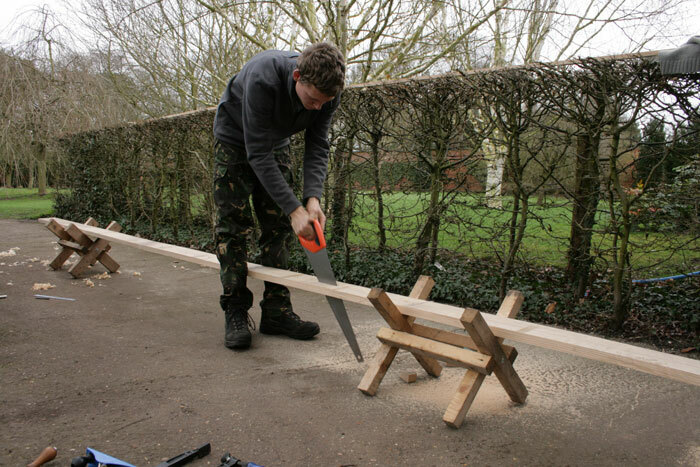 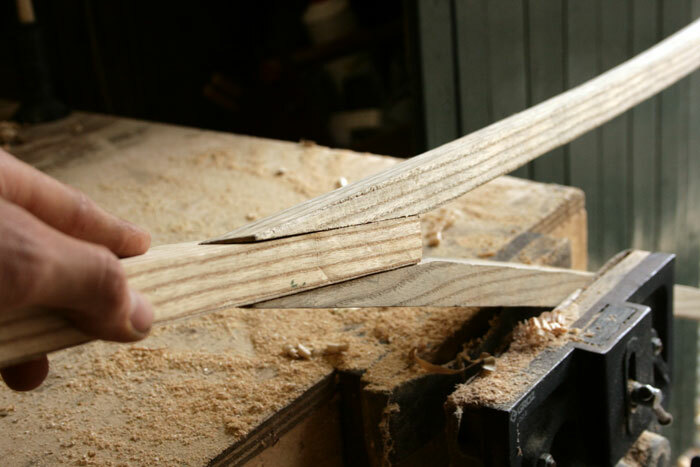 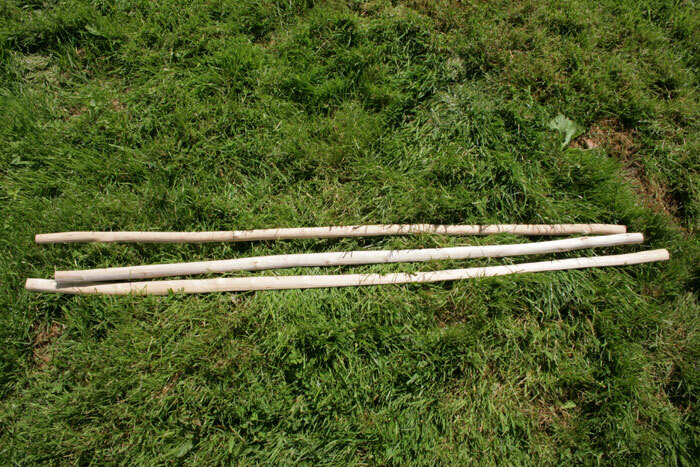 One piece of wood can be split into two; producing two rib blanks - These are then carved to correct thickness using a draw knife and shave horse. 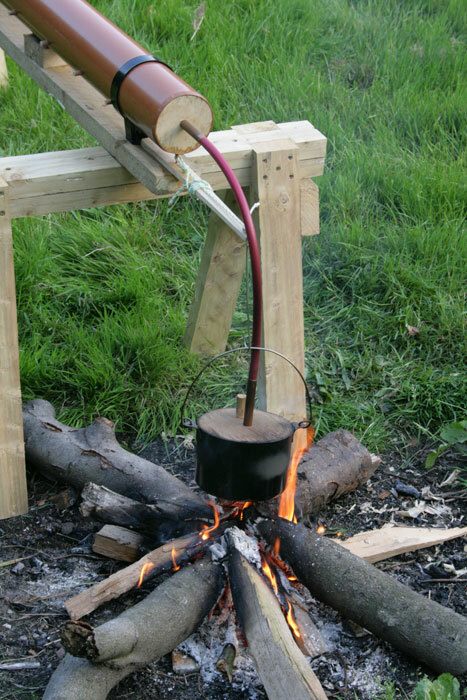 pipe and pot Linked together with a section of washing machine hose and two sections of copper pipe as connectors. 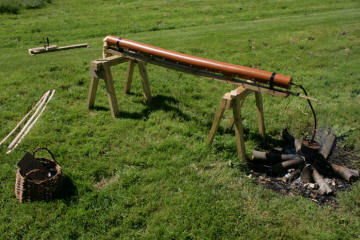 The hose is just the right diameter to fit snugly inside the copper pipe sections. 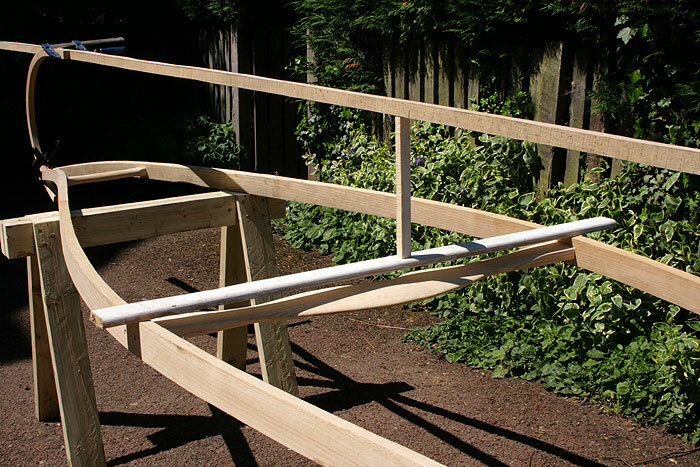 It's important to fit dowel pegs through holes along the length of the pipe creating a shelf for wood to sit on in the top half of the pipe. 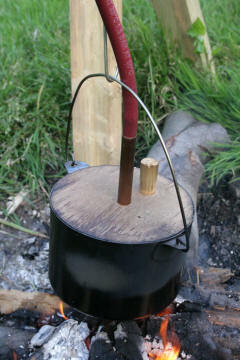 As steam rises; the top half of the pipe is naturally the hottest. Also, the rear end of steamer is propped up higher allowing good steam flow throughout . 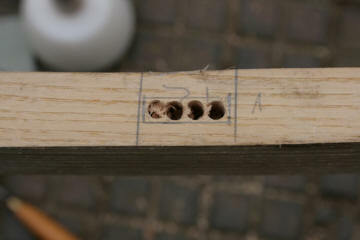 A small drip hole (2mm) is drilled on the underside of the lower end. 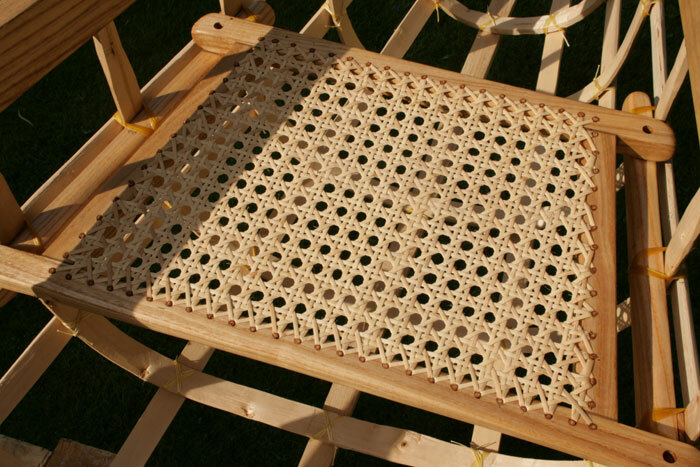 This allows condensation to escape and not build up. . 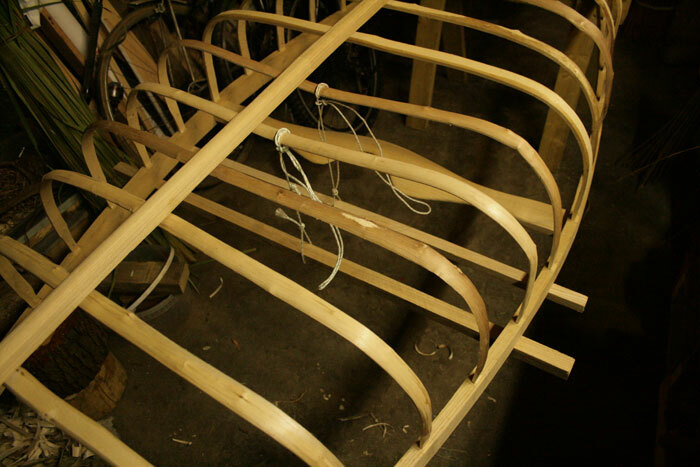 I number the ribs on the ends so I know which are the longest pieces without pulling them all out to check. They are then steamed for 20 mins before bending. I made this variable jig to bend the ribs with. 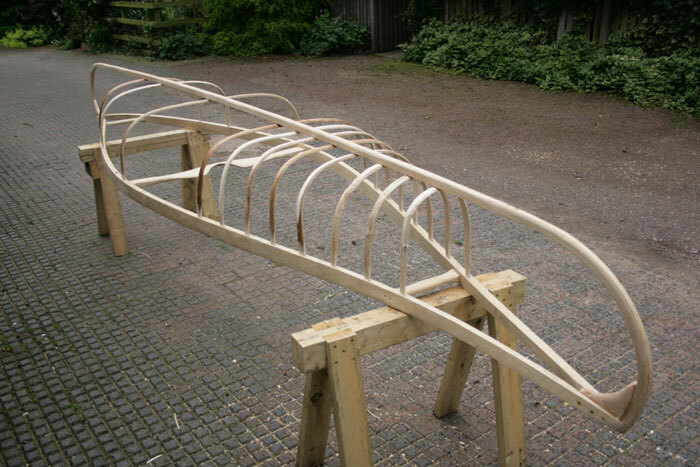 I measured the width between the gunnels at all the points where the ribs were to be fixed, then set the jig up to make ribs specifically sized for each point. 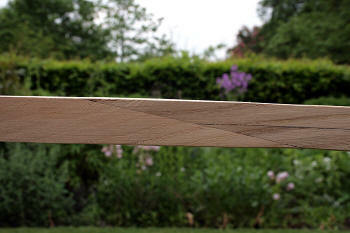 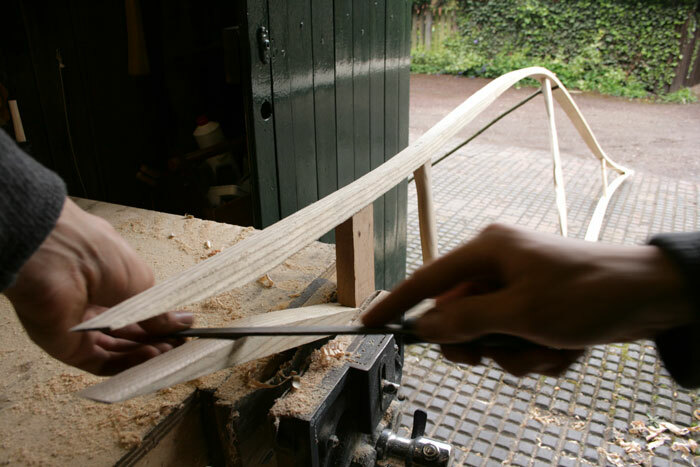 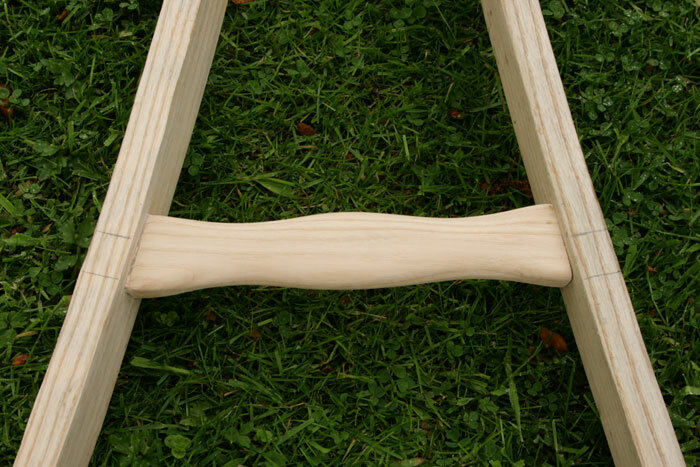 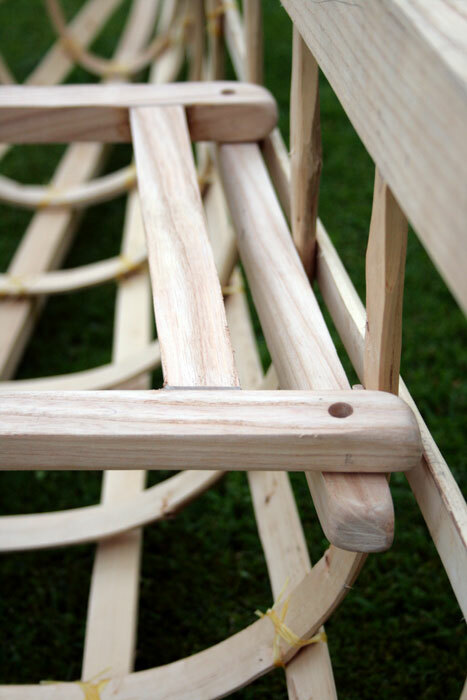 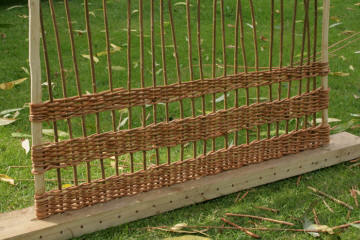 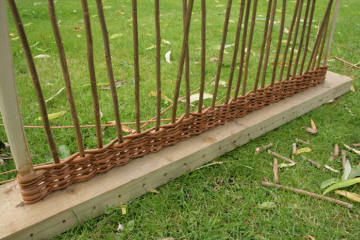 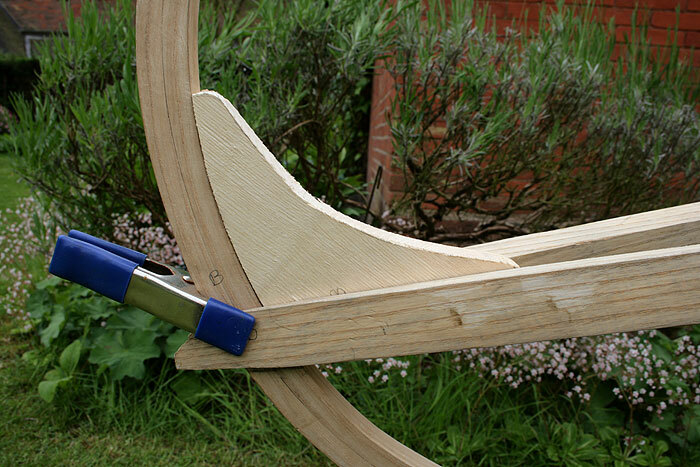 The bend on some smaller ribs is too tight and needs to be bent by hand and eye. 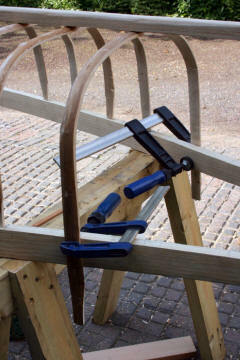 left hand side if fixed and right hand side is moved accordingly then firmly clamped in place. 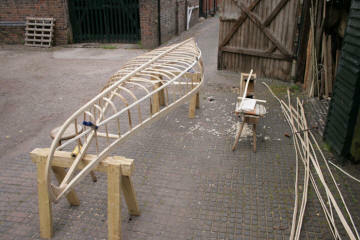 Rib tied to keep its shape then removed from the jig ready for the next one. 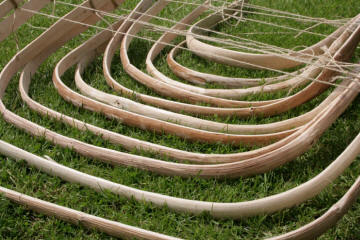 Ribs need to be bent quickly before they cool down too much. Ribs need to be carved to a very even thickness otherwise they deform or the wood folds at weak points. 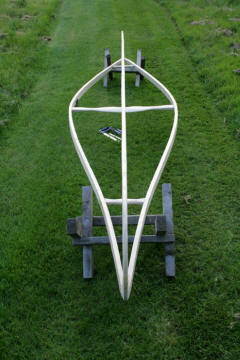 The rib is then marked on both sides where the rib meets the gunnels. 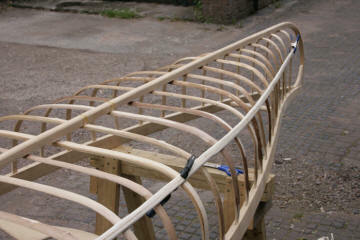 The rib is unclamped and an extra line drawn 15mm beyond this. These small sections will be the parts that slot into the mortise holes. I Then carved the ends of each rib with a knife nice and square like a tennon joint. 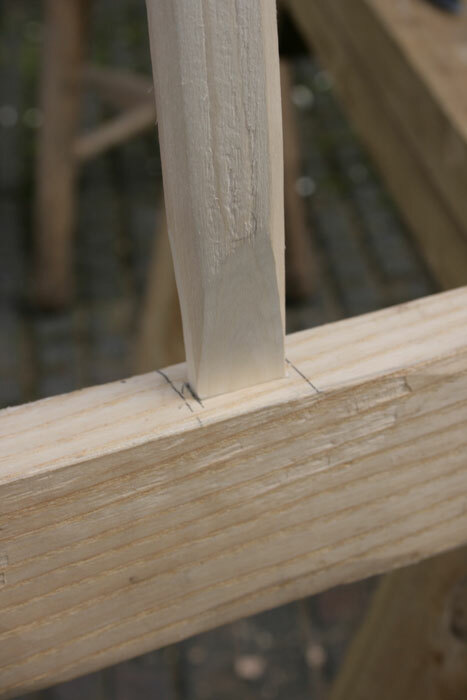 The dimensions from the tennon joints are then marked out in place on the gunnels. The centre is drilled out; making the chiselling easier. 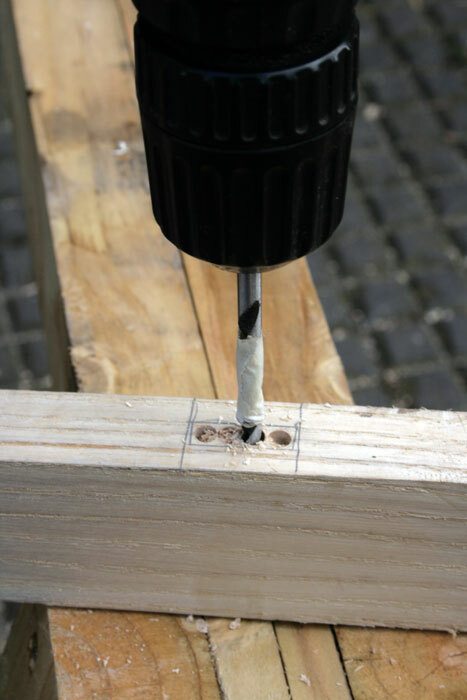 A piece of tape around the drill piece acts as a depth gauge so I know when I've reached 15mm deep. Some ribs were bowing upwards too much and needed pulling down flatter with some cord. After a while they take their new shape and the cord is removed. 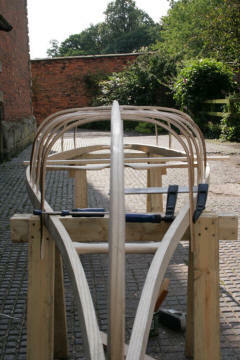 Longitudinals are now added from front to back. 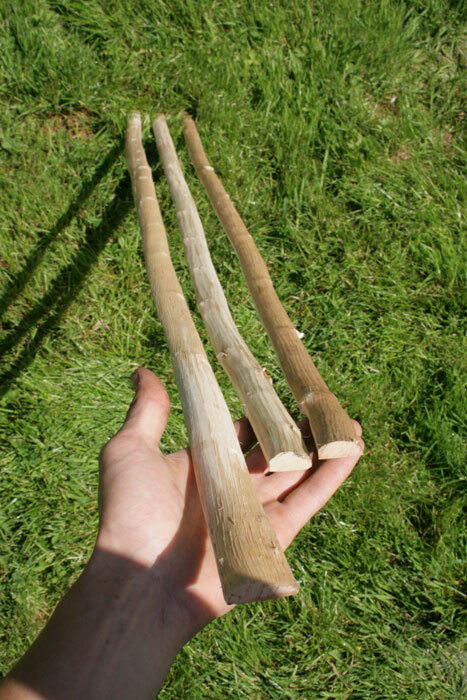 I carved them in the same way as with the ribs from Hazel wood. 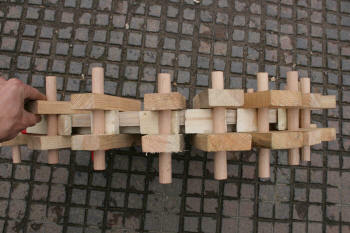 Some lengths were not long enough and needed to be spliced together. 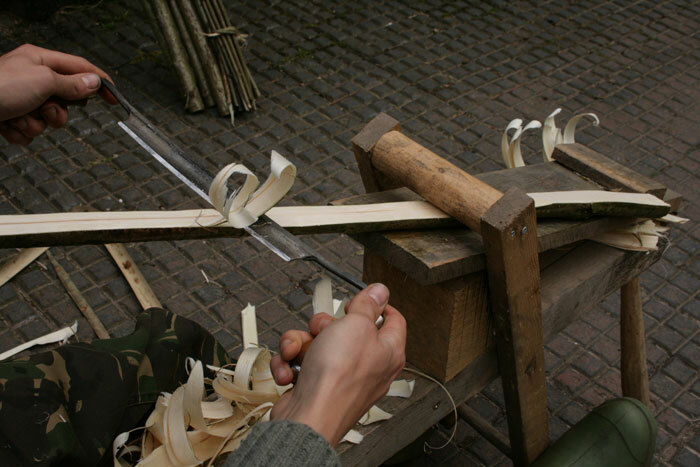 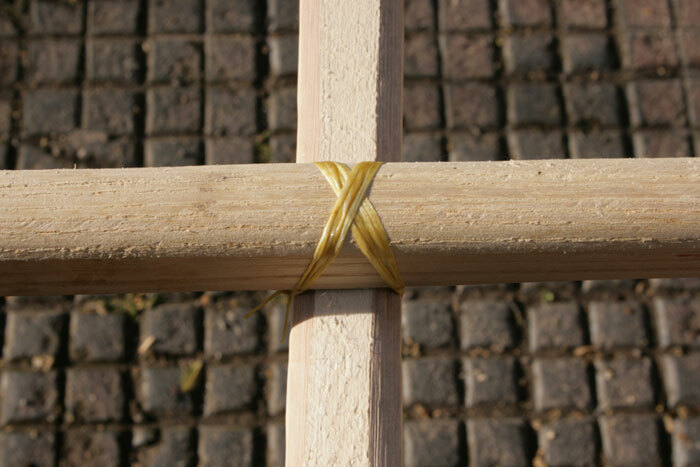 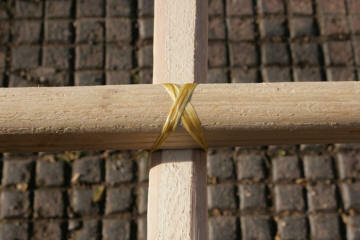 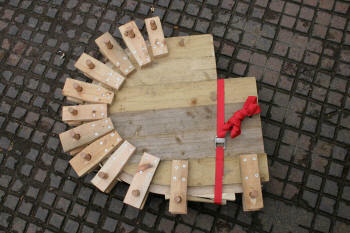 They are clamped in place first and then tied at every point where they cross each rib. It was time for making the frame work for the two seats...It's a long job and could take a whole article in itself to explain how to make these. 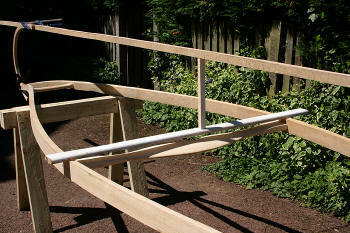 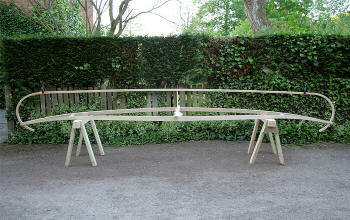 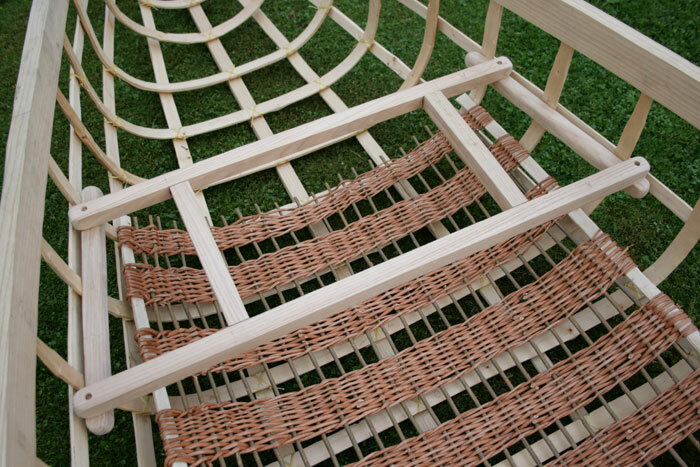 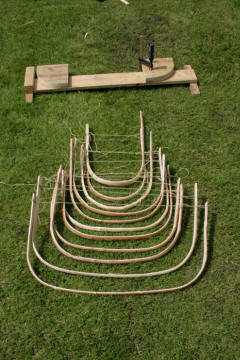 The seats fit onto rails which are attached to the rib and longitudinal framework. 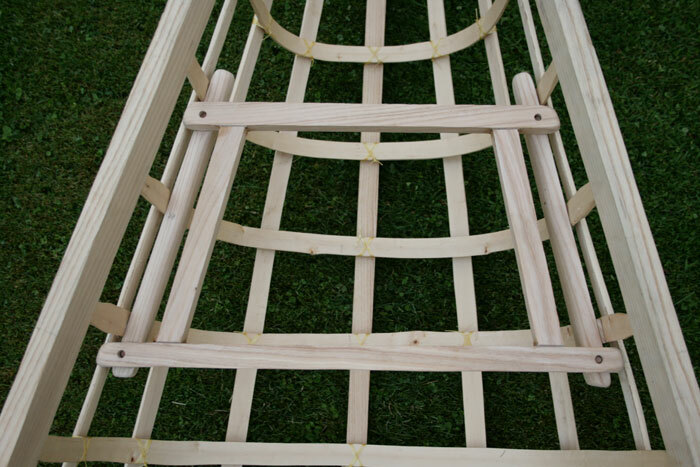 I used screws and bindings to attach the rails. 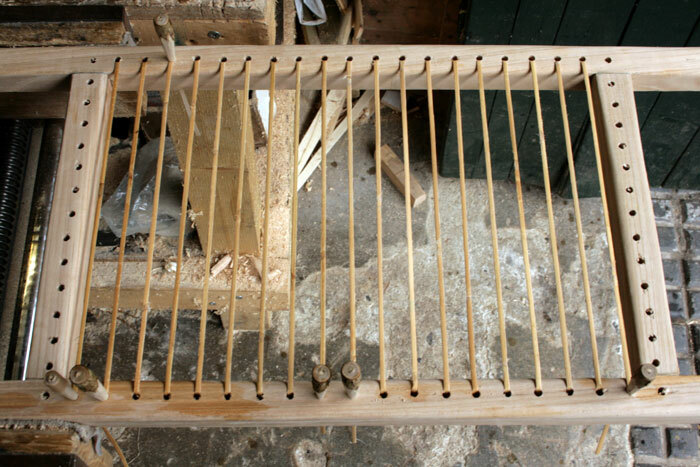 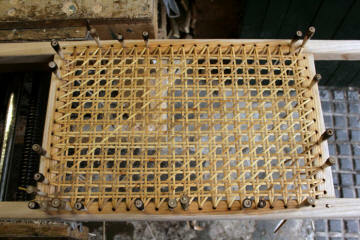 The seats are removable - they slot onto pegs fitted into the rails. It was then pretty straight forward to weave back and forth - in and out, in and out. I drilled holes into a length of wood to hold the thick uprights to start with. 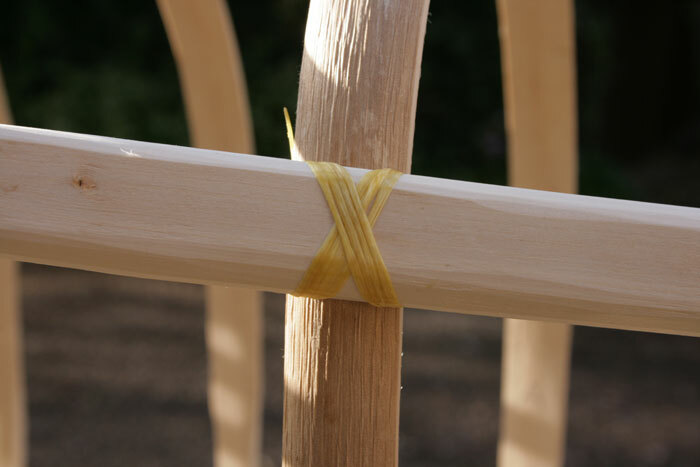 The two outermost uprights are slats of Hazel; This is for strength. 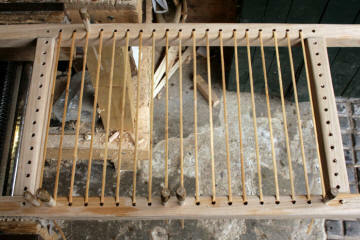 A lick of linseed oil on some of the wood work and I was ready to cover it with canvas! 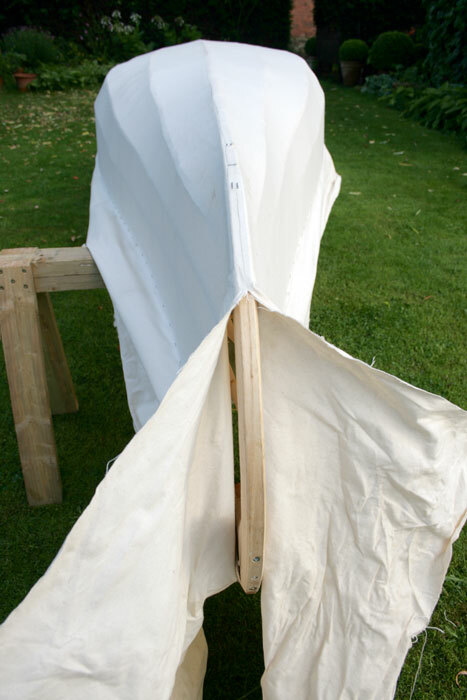 The canvas has to be stretched as tight as possible. 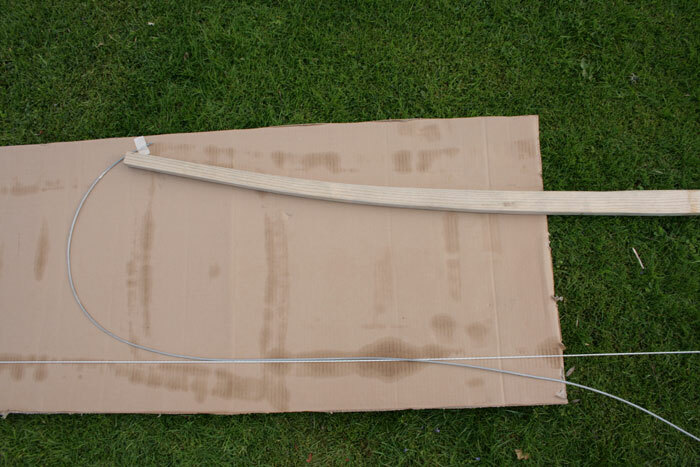 To explain briefly; one or two staples are inserted on one side, then the canvas pulled over tight and stapled on the other side... back and forth. 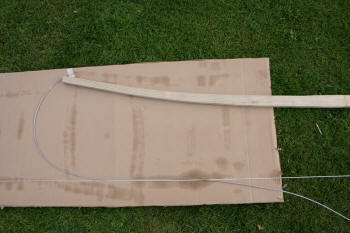 Also try to stretch canvas length ways some too. 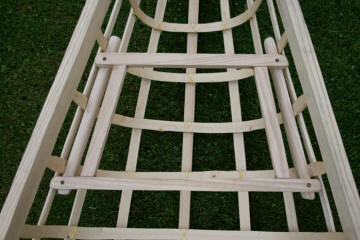 Then other side stapled and all excess canvas trimmed away. I then sealed the seam up with epoxy glue for a 100% watertight finish. 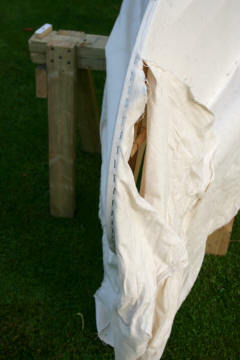 once fitted, wetting the canvas helps to tighten it slightly. 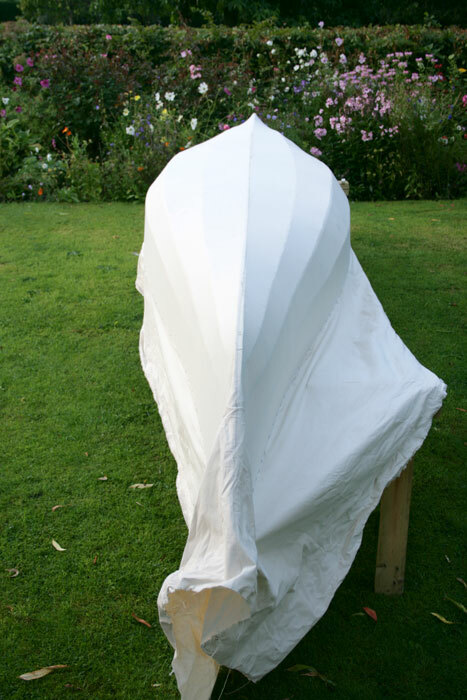 Paint the canvas with exterior grade paint. 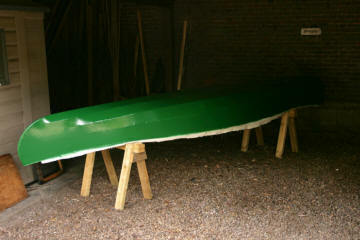 Firstly two coats of primer undercoat, then two coats of your coloured overcoat. 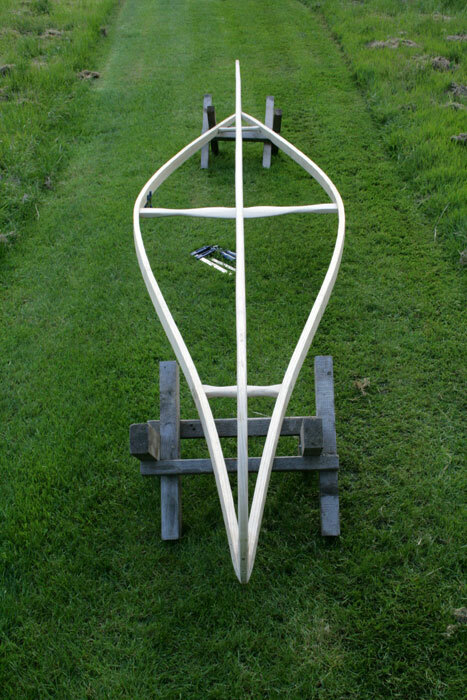 It was then just a case of trimming the canvas level with the top of the gunnels. 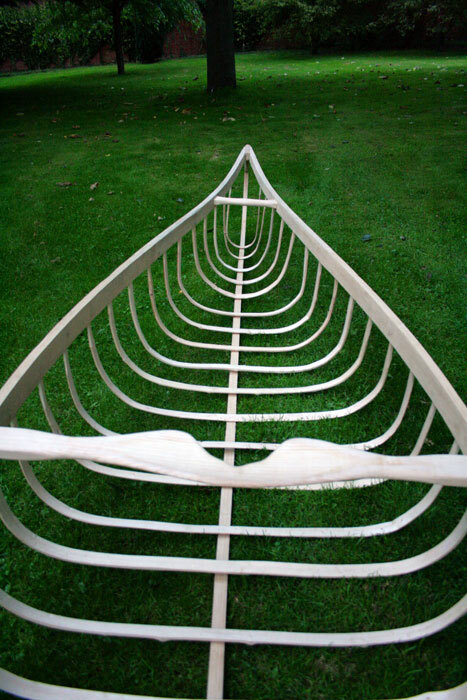 Then I could make and apply a strip of oak beading around the edge (which also covers up the staples) to complete the canoe... exciting! 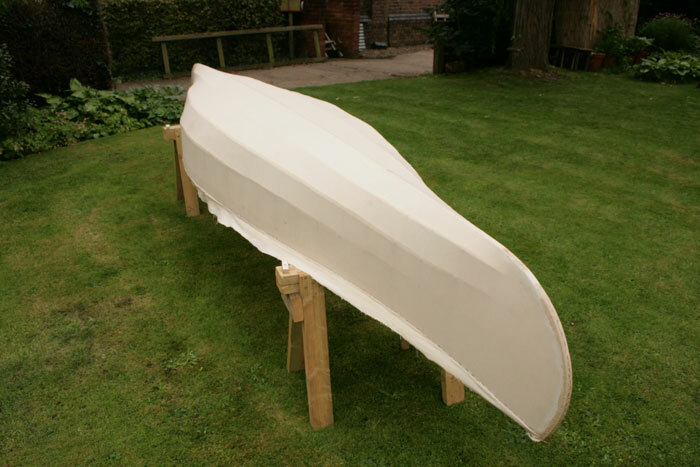 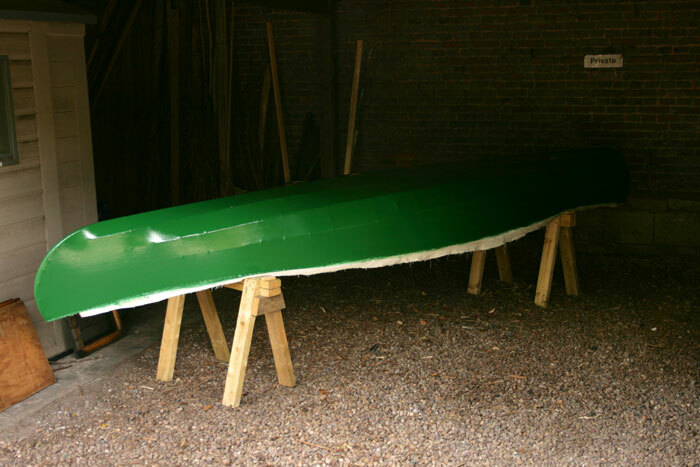 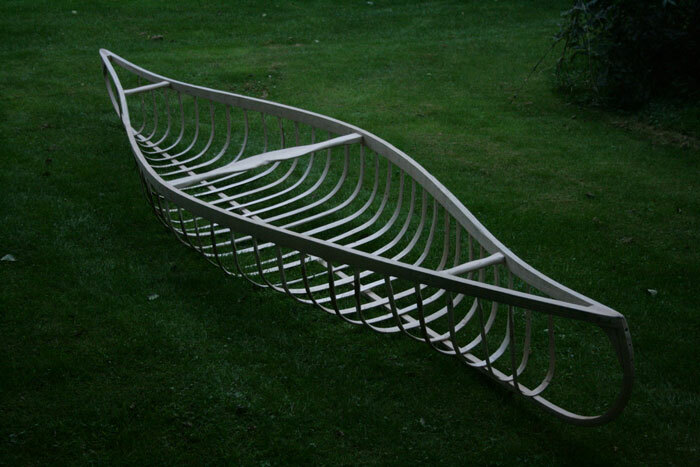 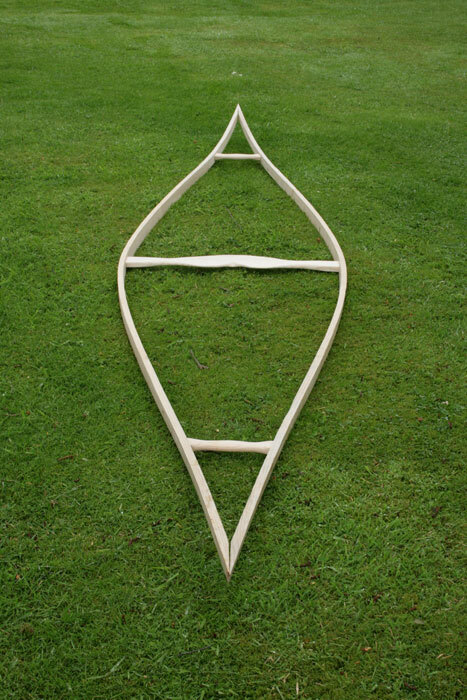 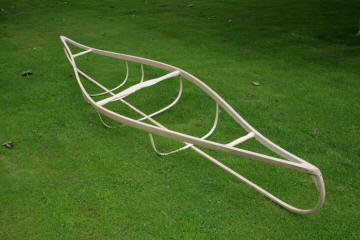 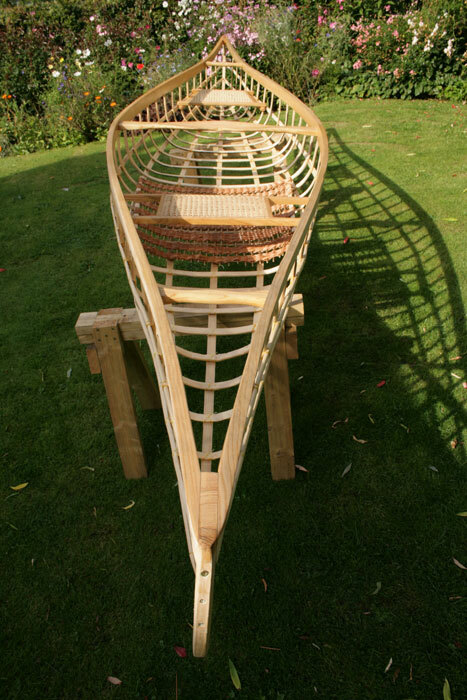 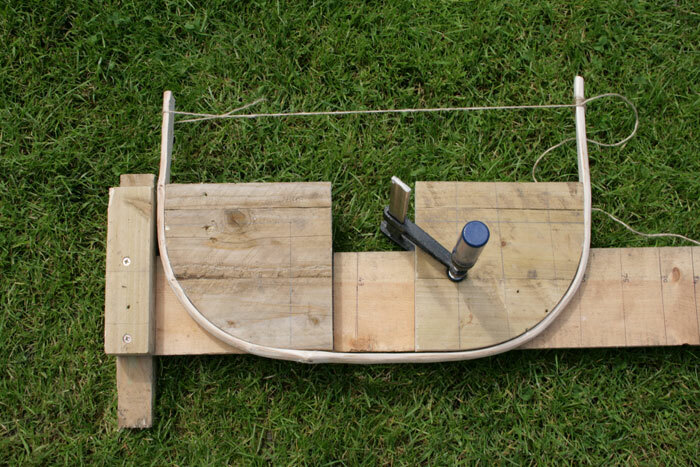 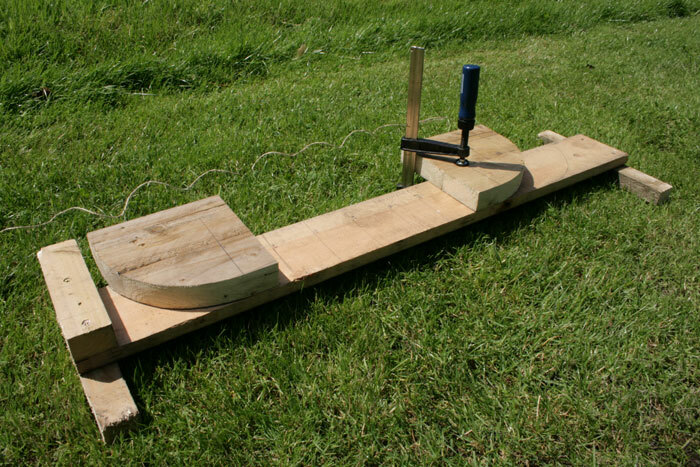 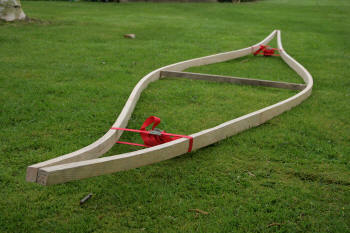 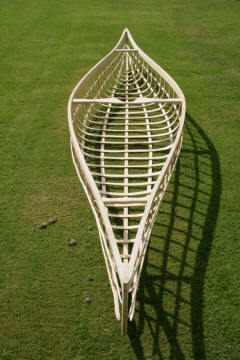 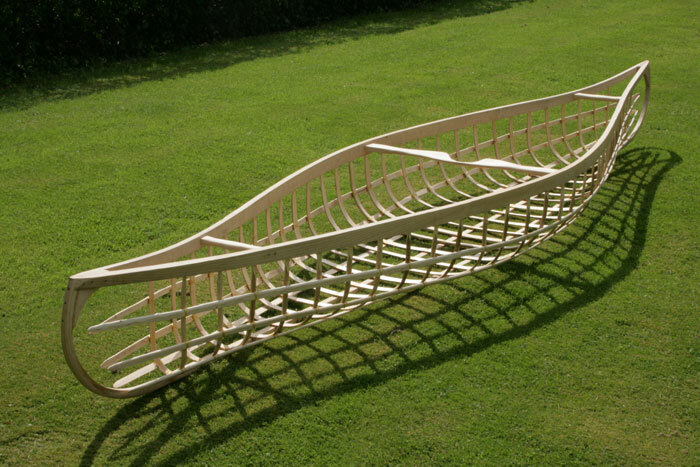 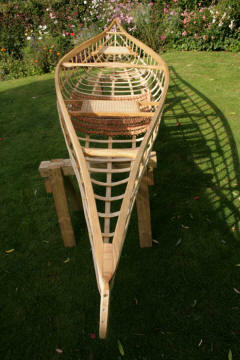 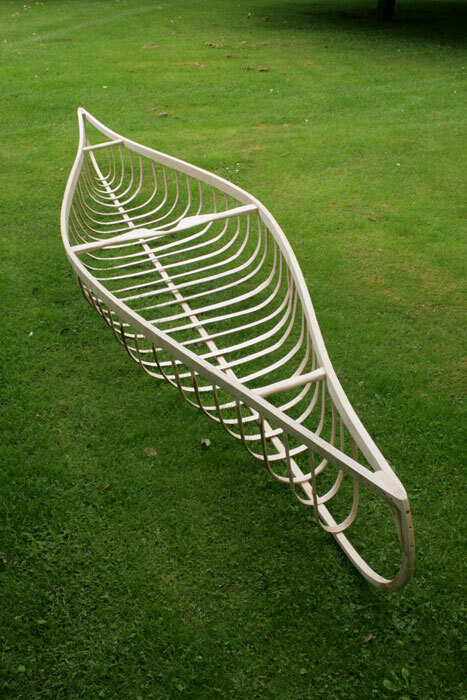 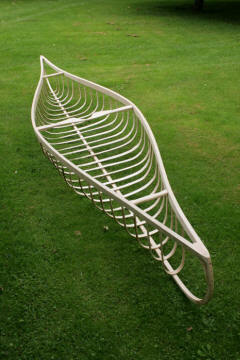 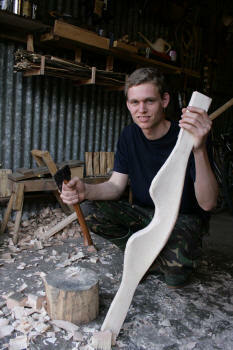 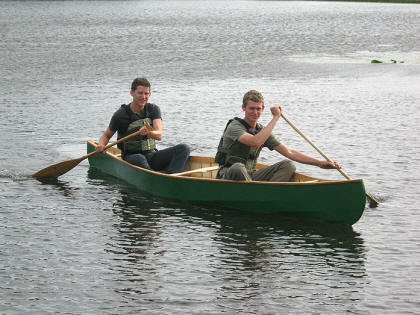 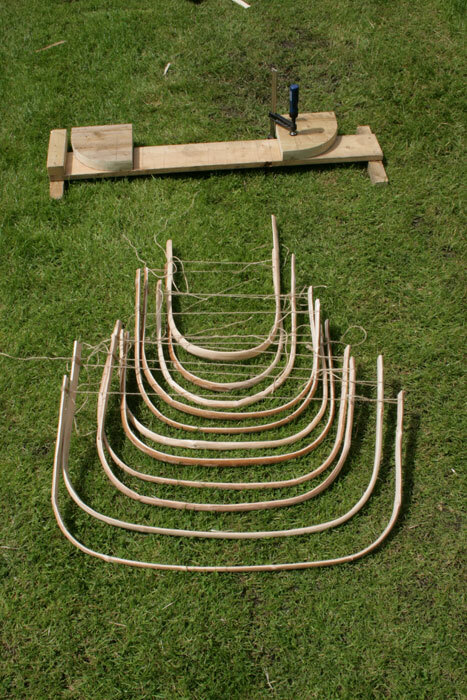 I hope this article has inspired to you have a go at making your own canoe... Have fun and enjoy every stage.